Hoya cv. Golden Eye - A Michael Miyashiro cross. I keep getting a lot of crap from people about not wanting to hear any criticism of others and not wanting to deal in personalities. They say they just want to enjoy growing hoyas. I have a few things to say to these people and that is, “Fine, go ahead and enjoy growing your hoyas but quit writing to me, telling me about your frustrations over getting what is obviously mislabeled plants and conflicting information about all phases of growing your plants!” If you don’t want to know something, don’t ask! Since so many of you are too lazy to do your own research and rely on the internet for all your information, don’t complain about being given false information. The internet is filled with people who don’t know doodly squat about a million subjects but who would like to have you think they know all there is to know about everything. Writing a name on Google is NOT research! This issue will be a critique of Fraterna vol. 19, #1, which is supposed to be a 1st quarter (Jan.-Mar. 2006) issue. It was, as with so many Fraterna issues, about 2 months late. The guest editor, Ted Green, wrote, “for the over 35 years that I have been involved with Hoyas there has been constant turmoil but it needn’t have been that way. Hoya growing should be an enjoyment, a pleasurable hobby, BUSINESS or whatever.” ….. The upper case is mine!. What Mr. Green failed to say is that he, himself, was the source of most of the turmoil. Most of it was due to his cavalier method of labeling of plants, which made collecting and growing hoyas an expensive, unpleasant experience, for many of his customers. I agree with Mr. Green. It needn’t have been a source of turmoil and it wouldn’t have been if he’d not mislabeled so many of the hoyas he sold to me and to others who egged me on into complaining about it. Nobody enjoys buying 20 different names only to learn all twenty are the same identical clone of the same species. For Mr. Green it would have, indeed, been a pleasurable “business or whatever” if I had not interrupted a private gathering of his at an HSI meeting in Ft. Lauderdale, FL in the early 1980s. He was not an HSI member at the time but he’d been invited to the meeting as guest speaker. He abused our society’s hospitality by using it to call a special meeting, within our meeting, to promote his BUSINESS. We had a tour of home greenhouses and commercial growers. While we were at one of the nurseries, Mr. Green got permission from the nursery manager to use a meeting room. He rounded up all the dealers present and invited them to his private meeting, taking care that I was not included. I was in the greenhouse where all of our members were supposed to be and suddenly found myself alone. I thought I’d been left behind by our bus driver. I went to the manager’s office. She told me that a Mr. Green had asked for a meeting room and had told her that his meeting was private. I told her, “I have the checkbook and I pay the bills for this meeting so you’d better let me in that private meeting room or you don’t get paid.” She showed me the way and opened the door. This man was a guest at our meeting and had used it as an opportunity to take over the meeting and try to enlist our dealer members in an illegal pact. This was something that would have profited only Mr. Green because his prices were higher than anyone else’s (as they still are). He usually had “names” before most others did. Most people willingly waited a year or two or three to buy new things because that was how long it would take the other dealers to grow what they bought from Mr. Green.. By fixing prices, he figured, correctly, that there’d be no need for anyone to wait a few years to find the same things at cheaper prices because there’d be no cheaper prices. Only he would have profited. Those other dealers were smart enough to know that! As he said, “Hoya collecting should be a pleasurable hobby, BUSINESS or whatever.” The question is, “Pleasurable for whom?” And what would make it pleasurable? It seems to me (and to a lot of other people) that pleasurable to Mr. Green is for all people to accept his false allegations that his labeling has always been 100% correct and that no one could ever prove him wrong because all of the literature and all of the herbarium material that could prove his identities wrong were destroyed in WW-2. I had been told that by Ms. Loyce Andrews. I quoted her in The Hoyan (without using her name) and told our readers that I didn’t believe a word of it. I’d have never known that Mr. Green was the source of that misinformation if he had not then written to our president and to numerous other HSI members and started WW-3. He was adamant in asserting that those false claims were true and alleging that I’d written that it wasn’t true to put him out of business in order to profit my own hoya selling business. He demanded that I be removed as editor of The Hoyan because, he said, “Being editor of a plant society bulletin and being in the business of selling hoyas was a conflict of interest.” So, to prove him wrong, I sold my business and for many years after that did not sell any hoyas at all. So, now, with me out of the competition, it is no longer a conflict of interest for a seller of hoyas to edit a Hoya Society Bulletin!!!! He reminds me of a certain church which says, “Truth has rights that error does not possess” and, of course, that church thinks (as do those Muslim terrorists) that only IT possesses truth! If it is okay for him, why wasn’t it okay for me? He added, “This turmoil can be rectified with a better understanding and sharing of knowledge and opinions, experiences and even secrets, that might be accomplished by the publication of Fraterna and if my contribution as “Guest Editor/Contributor” has helped in any way, then I am glad that I volunteered to be a part of the team.” What secrets, I wonder? Back in the late 1960s, before Mr. Green started selling hoyas to retail customers, I obtained a Loyce Andrews catalog with 65 hoyas names listed. I purchased all 65 of them. Each year after that, Ms. Andrews’ list grew longer until (by 1978) it had over 200 names. It took me a long time to sort through them but I was eventually able to prove that of the 200 names in Ms. Andrews’ catalog, only 7 names were correct and one of those only partially correct. I was very frustrated over buying the same identical species, (and it one that appeared to be the same identical clone of the same species) over and over with different labels. I am not and was never a wealthy person. I don’t like being cheated. I believe that when one pays $25 or more for a plant or cutting one ought to get what one pays for. 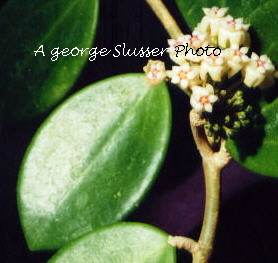 A Hoya australis subsp. tenuipes labeled as Hoya bandaensis, Hoya griffithii, Hoya obtusifolia, Hoya pottsii, Hoya pycnophylla and Hoya samoensis is not my idea of fun, even though Mr. Green says that growing hoyas should be a pleasurable hobby. Nor did I enjoy paying from $10 to $25 dollars for a Hoya coronaria and a Hoya coriacea and getting two of another Hoya australis subspecies. It wasn’t fun ordering a Hoya australis from Ms. Andrews and getting a Hoya carnosa with a Hoya australis label on it. And how about ordering a Hoya imperialis and getting a Pink Silver with a Hoya imperialis label; then later on getting a Hoya globulosa with a Hoya imperialis label. Still later, ordering a Hoya multiflora and getting a Hoya globulosa labeled Hoya multiflora???? Ms. Andrews told me that her source was Ted Green. She said that he sold only to her. I phoned her and told her that I had ten hoyas with identical leaves and identical flowers in bloom and sitting side by side. I said, “It is obvious that all are the same species.” She said, “They look the same to me too.” So, I asked, “Why do you still list them as different species?” That is when she made her buck-passing remark about using the names on them when she got them and naming Ted Green as her source. My remark to that was, “I don’t think Ted Green is a very knowledgeable Hoya person”. She said that she didn’t think he was either and she added that she would not be buying any more of his hoyas because he had (she said) cheated her out of over $600 worth of cuttings. It was then 1977 and that was when Ted Green put out his first retail catalog with 32 hoya names (or numbers) on it. I obtained all 32 of those on his list and found that he listed Hoya australis subsp. tenuipes as: Hoya bandaensis, coronaria, diversifolia, obtusifolia, and samoensis. He did not list a Hoya pottsii. Having read something about him in Houseplants and Porch Gardens and having gotten a letter from Bishop Museum in Hawaii saying that he was a hoya expert, I packed up a plant of the Hoya australis subsp. tenuipes I’d gotten from Loyce, labeled Hoya pottsii and sent it to him. I told him I’d bought it as Hoya pottsii but knew it couldn’t be that and I wondered if he could identify it. He wrote back, enclosing a copy of the picture of Hoya pottsii which accompanied the original publication of the name. He said that the hoya I sent him was, indeed, Hoya pottsii and added, “I’ve enclosed a picture of Hoya pottsii to prove it.” Well, it doesn’t take 20-20 vision to look at that picture and see that it could not possibly be the same species. He failed the test! Hoya bandaensis. – was Hoya australis subsp. tenuipes. Hoya chlorantha. I bought that from him. It turned out to be the one I now call sp. NH-1 (Mr. Green now calls it Hoya diptera and I’m certain that is wrong). On getting that, I wrote to him and included a copy of the original, illustrated publication of Hoya chlorantha.. I told him that his plant was mislabeled. He wrote back and said, “I caught that too but I had to call it something!” Oh, yes! I still have his letter in my file. Hoya cinnamomifolia. What I got was Hoya pottsii. Hoya coronaria. What I got was Hoya australis. Hoya crassipes. What I got was Hoya diversifolia. Hoya diversifolia. What I got was Hoya australis subsp. tenuipes. Hoya globulosa. What I got was Hoya australis subsp. australis. Hoya imperialis. I got hoya imperialis var. rauschii. Hoya linearis. I got the real thing this time. Even a stopped clock is right twice a day. Hoya litoralis . I don’t know what I got. It didn’t live long enough for me to find out. Hoya longifolia. What I got was Hoya shepherdii. He still sells that one mislabeled. thought that was correct at that time. same two labels, both from Mr. Green. Hoya nicholsoniae. I got one of the many clones of Hoya pottsii. Hoya obovata. What I got was Hoya kerrii. Hoya obtusifolia. What I got was Hoya australis subsp. tenuipes. Hoya puber: What I got was Hoya serpens. Hoya purpurea-fusca. What I got was Hoya pubicalyx cv. Pink Silver. Hoya sikkimensis. What I got was Hoya bella. Hoya samoensis. What I got was Hoya australis subsp. tenuipes. Hoya ssp. (30) -- I don’t remember what this was..
* I got a note saying that he couldn’t send Hoya multiflora because he’d have to wait until his neighbor went out of town because he’d have to steal it out of his neighbor’s yard! I wrote to both Ms. Andrews and Mr. Green and asked them to join me in forming a Hoya society . I thought one was needed to help identify all those mislabeled plants. Ms. Andrews, whom I’d thought my friend until then, responded by putting out a new catalog telling people not to believe me and calling me a “Self-appointed expert that didn’t know the first thing about the subject.” She also wrote a bunch of hate letters about me. I told her she was being paranoid. She wrote a letter to another about me and said, “Chris Burton told me that I am being paranoid. She is so ignorant that she doesn’t know that the correct word is “paranoia” not paranoid and she thinks she can start a hoya society!” The recipients readdressed those letters and sent them to me. She added that, in the past, others had tried to start a hoya society and had tried to prove her labeling wrong but all failed just as Chris Burton would because, she claimed, that all hoya literature had been destroyed in WW-2 – as if only one copy of any book or periodical existed or that all copies were in the same place to take a bomb! Mr. Green’s response to my request that he join me in forming a society was a letter telling me that, “We don’t need a hoya society. All one would do would have people telling us our labeling was all wrong and we don’t need that.” Never mind the fact that our labeling was all wrong!!!! Selling hoyas to the public mislabeled and advertising those mislabelings in catalogs, newspapers and magazines is nothing short of “false advertising” and it as illegal as hell! Mr. Green, over many years wrote letters of complaint to HSI officers and board members complaining that I was spoiling his hobby for him by exposing his false labeling (though he never admitted to false labeling). Well, he spoiled the pleasure of countless numbers of hoya hobbyists by selling them mislabeled plants. As I (and many others) saw it, the only one getting any pleasure out of it was Mr. Green. His pleasure had to be that of “toting the money we paid him to the bank!” His pleasure was not so great when his orders were less than he desired due to me telling people what they’d be getting if they ordered certain names listed in dealer catalogs. I did not confine my exposes to him. The situation has improved but this habit of labeling first and identifying later hasn’t gone away. I have been told by people who have been on hoya hunting trips with him that as soon as someone spies a hoya high up in a tree or hiding under a shrub across a stream that Mr. Green immediately exclaims, “That is Hoya _____; I’d recognize it anywhere,” while Mr. Kloppenburg immediately declares it to be a new unpublished species, which he vows he’ll name and publish..
EVERYONE MAKES MISTAKES. All of us have misidentified a hoya or two in our day but, in my opinion, Mr. Green holds the world record. Although Mr. Green said that his list of cultivars was “As of 1/1/2006 and was based on ALL (upper case mine) of the available information, his list is far from complete. How could he have missed the extremely long list of cultivar names published in Asklepios several years back by Phil Clarke. It was several pages long. Surely he must have seen the additional list and descriptions of hybrid cultivars published there in 2004 by his fellow contributor to this mess, Carol Noel. He failed to list a single one of those cultivars. All of that information was available “as of 1/1/2006 and before!. Error 2 – He misspelled Shepherdell (as Sheppardell). Error 3 – Shepherdell, is not a cross of carnosa X longifolia. It is a cross of carnosa X shepherdii. Error 4 – The un-named MM hybrid he listed at bottom of this section is not a cross of Hoya meredithii. Hoya meredithii is not a validly published name. 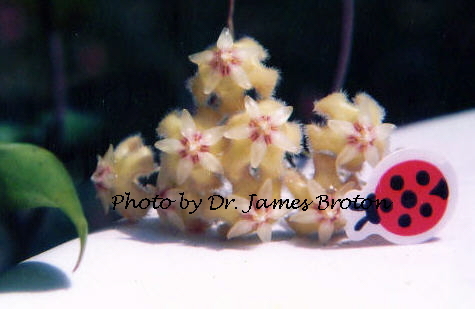 This is a cross of Hoya vitellinoides X incrassata. Notable for its absence from this list is MM’s lovely hybrid cultivar, Golden Eye, a cross of Hoya erythrina X incrassata (See above on page 1). Hoya erythrina X Hoya incrassata – an MM cultivar. Last time I asked, MM didn’t remember what happened to this and neither did Dr. Broton. Christine (Hoya subquintuplinervis X Hoya pottsii). A Michael Miyashiro cross. Joy (H. sp. Laos X Hoya vitellina). A Michael Miyashiro cross. Noelle (Hoya vitellinoides X Hoya vitellina). A Michael Miyashiro cross. Jennifer (Hoya incrassata X Hoya finlaysonii). A Michael Miyashiro cross. Mrs. G. (a Hoya australis seedling). Source not known. Napoli (Hoya archboldiana X Hoya macgillivrayi). A Michael Miyashiro cross. I have no argument with Mr. Green’s calling any of those variegated hoyas mutants, however, I will argue that most of those Hoya carnosa and pubicalyx cultivars which he says are mutants are NOT. I corresponded with Genevieve McDonald for a short time before her death, when she was a member of HSI. She told me that all of those “Ones” – Bright One, Cream One, Dapple Gray, Pink One, Pretty One, Sweet One, Little One, Little Star, Red Buttons and Gold Star were her seedlings. She said she did not know the parentage of them but all were grown from seeds found on the hoyas growing in her yard on Merritts Island, Florida. For all that she knew they were either selfed seedlings or hybrids. There is nothing among the lot that points to any one of them being mutants. Mr. Green says that Dale Kloppenburg’s cv. Fresno Beauty and cv. Reva are mutants which is very strange indeed. Mr. Kloppenburg published cv. Fresno Beauty in The Hoyan. There he said it was selfed seedling of Hoya pubicalyx cv. Pink Silver, pollinated by an insect. He also wrote later that cv. Reva was a sister seedling from the same follicle. Quite frankly, I can’t tell much difference amongst the two cultivars and their parent, except that, perhaps, Fresno Beauty’s leaves may be slightly darker in colour. The differences are only what you’d expect from seedlings of any selfed species of plants. Among the “mutations” on Mr. Green’s list are two names that are phony as a $3 bill. Those names are Waffles and Dimples 8. Dimples and Waffles are two names that were made up by a grower in Ohio by the name of Esterbrook and he didn’t add an 8 to either of them. The man didn’t want to pay royalties to Cobia for his patented hoyas so he made up the names Dimples and Waffles and sold cv. Krinkle-8 with those labels. I believe that Krinkle-8 is a mutant and therefore Dimples and Waffles are too because they are Krinkle-8. The name Dimples-8 doesn’t appear to have ever been used prior to this publication by Mr. Green. Esterbrook also made up the name Cleopatra and put that label on a patented Episcia, Pink Brocade. The man made the mistake of bragging about this (in front of a large audience) otherwise I’d never have suspected.. He said that no one would ever be able to prove he hadn’t made the same crosses and had the same patterned plants appear in his seedlings. He was probably right there – he should have kept his mouth shut! Mr. Green listed among his “mutants” several Cobia things that are mutants. He misspelled the names Mauna Loa (as Mona Loa) and Lura Lei (as Laura Lei). He left out Cobia’s Argentia Picta (trademarked as Silver Princess). The most glaring error is Mr. Green’s statement that Cobia is the largest grower of Hoya varieties in the US and that he has made a business out of naming varieties and copyrighting those names. This is NOT true. First off, if I am to believe one of his former associates, Cobia retired and is no longer in business. Next, Cobia never copyrighted a single name. He patented his mutants and gave them Trademark names. Trademarks are granted at the state level; patents at the Federal level. Names, like titles, cannot be copyrighted. Mr. Green’s proposal that IHA create a registry containing photographs only (no herbarium sheets) is in the same class as his suggestion some years ago that HSI appoint a committee (with him as a member of it) to decide what names we were to call all the hoyas we had. That simply can’t be done because there is an organization that governs the naming of plants and it has a Code which dictates such things. There is also a Code for naming and identifying cultivated plants. Douglas Kent and I were in contact with the powers that be governing cultivated plants about 1990. They sent me a copy of the Code for cultivated plants. The top registrar was in England and the one in charge over here was located in Canada. The National Association of Nurserymen (as a public service) published and distributed the Code. I reprinted it in The Hoyan some years ago. Among the rules was a provision stating that cultivars be represented by herbarium specimens which should be deposited at either Cornell University’s Herbarium or US National Herbarium at Smithsonian. This Code for cultivated plants states that cultivars named before the Code for Cultivated Plants was created would stand but that all future cultivars must be published in vernacular and must be given NON-Latin names of no more than three words (making all those variegated things of recent origin, called “albo-marginata” invalid). It also rules that if a cultivar is named for a living person, one must have written permission from that person before his or her name is used. Beginning of list of cultivar names from Chris Burton’s notes. ‘California Motoskei’ (I was sold this one by Rainbow Gardens. I believe that it is not a cultivar but is actually Hoya australis subsp. tenuipes). ‘Alba’ (Same old, same old pink flowered thing)! ‘Argentea-Picta’ (Trademark name, ‘Silver Princess’) – This Latin name was given it before the Code was written. ‘Bold One’ (A Genevieve McDonald cultivar). ‘Convovulaceae’ (A name given to a cultivar of Hoya carnosa variegata having smaller, slightly twisted leaves, by the owner of Loyce’s Flowers’ in the 1970s. I have found the cultivars ‘Holliana,’ ‘Marlea’ and ‘Divan’ to be indistinguishable). ‘Cream One’ ( A Genevieve McDonald cultivar, also called ‘Lime Cream’ and ‘Lime Green,’ but only by people who can’t keep their facts straight). ‘Darling One’ (A Genevieve McDonald cultivar). ‘Dimples’ is a made up name, put on labels by an Ohio grower (no longer in business) who wanted to avoid paying royalty to Cobia. The man was so brazen, he bragged of doing this (in public). This is Hoya cv. Krinkle-8. ‘Divan’ (A dwarf Hoya carnosa var. variegata. I see no difference between this and cv. Holliana. If they aren’t the same cultivar, they have to be from the same cross). ‘Green Exotica’ (When cv. Rubra reverted, the owner of Loyce’s Flowers cut the green parts out; rooted them and sold them as cv. Green Exotica). 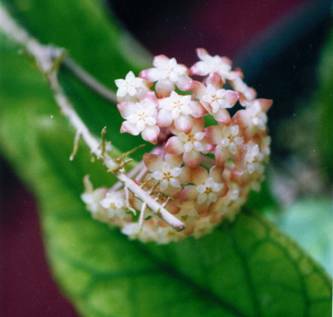 ‘Holliana’ (A dwarf form of Hoya carnosa var. variegata. I see no difference between it and cv. Divan). ‘Krinkle-8’ (A Cobia introduction; looks like it could be a tetraploid; thick leaves & stems with 8 dimples on them). ‘Little One’ (A Genevieve McDonald cultivar that grew up after it got named and distributed. It is huge for a carnosa). ‘Little Leaf’ (Another Genevieve McDonald cultivar. It’s not a miniature but looks like a ‘Krinkle-8’ that didn’t take its vitamins – a bit stunted in growth). ‘Little Star’ I’m unfamiliar with this one. ‘Manda’s Compacta’ (An almost flat, extremely thick leafed thing with leaves closely spaced. Leaves glabrous, with a glaucous wash over them, almost round.. Flowers typical, pale pink carnosa flowers). ‘Pixie Krinkle’ (A true miniature version of cv. Krinkle-8. I do not know the source but I got mine from Stu Cramer of Ft. Lauderdale, FL. Stu said he got it from Glasshouse Works. I don’t believe they have it anymore). ‘Quiescent’ (Source not known. I can’t distinguish between it and Hoya carnosa. My source said she couldn’t either but she said, “I sell them with the labels that were on them when I got them.” Good ole buck passing excuse for mislabeling). ‘Rubra’ (trademarked as ‘Krimson Princess’). ‘Snow Ball’ (a misnomer – flowers are huge and very pink, not white as tooted.). ‘Snow Fire’ (I believe this is cv. Snow Ball. I say this because I sold ‘Snow Ball’ to the only dealer I know of that ever listed the name ‘Snow Fire.’ When I bought it from him, it appeared to be the same). ‘Superba’ (Although this has been in trade for at least 40 years, I believe that it and ‘Snow Ball’ are one and the same. ‘Susie Q’ (Source not known. Not much different from all the rest). ‘Sweet One’ ( A Genevieve McDonald cultivar with the most delicate, purest pink flowers of all the Hoya carnosa cultivars I’ve seen). ‘Tricolor’ (trademarked as ‘Krimson Queen’). ‘Verna Jeannette’ (This is a better behaved ‘Silver Princess.’ Named, I’ve heard, for Mr. Cobia’s mother). He did not patent this one. ‘Waffles’ This is cv. Krinkle-8. Same Ohio seller who made up the name ‘Dimples’ for the same cultivar is responsible. He bragged of it in public. ‘Wilbur Graves’ (Broad motoskei-type leaves but often with half or more of the leaf white in an irregular pattern. ‘Gringle Curl’ (Same dealer catalog a year later shows this name. She changed it when I told her the Crinkle was wrong. I did not supply the name Gringle. That was her own idea). This is cv. Krinkle-8. ‘Mauna Loa’ (trademarked Lura Lei and most often mislabeled as Laura Lee, Laura Loa, Mona Loa and Mona Laura – in other words, if hoya growers can find a wrong way to spell it, they’ll do it)! ‘Picta’ (Made up cultivar name, given to cv. Mauna Loa by a Fresno, CA hoya seller who couldn’t keep his facts straight)! ‘Regalis’ (mislabeled on internet as ‘Variegata,’ ‘Variegated’ and ‘Krinkle.’ The names, Indian Rope, and Hindu Rope have been applied to this by sellers who make up names for anything new to them. It’s less trouble than learning the right name and often more lucrative (i., e., if they used the right name, they couldn’t sell it because all their potential customers know they already have it). ‘Tove’ is the name given to a mutation on Hoya compacta. It differs from others in having silvery splashed leaves. I’ve been told that it has been circulating in Sweden for several years. ‘Compacta Variegata’ (A made up name for cv. Regalis by a Fresno, CA hoya seller who couldn’t keep his facts straight). ‘Tove’ is the name given this mutation that appeared on what someone thinks is Hoya lacunosa., but probably isn’t. I see nothing in the Code for Cultivated Plants specifically prohibiting the naming of two cultivars with the same name when they belong to different species but I think that “goes without saying.” But I guess that some things have to be spelled out repeatedly for some people to get it.. This one is said to differ from the norm in having a dark, copper tinted leaf and light rose coloured flowers. Growers tell me that they’ve grown it for several years and have seen no sign of it reverting. ‘Lida Buis’ is a variegated form of this species, having green margined leaves. ‘Luis Buis’ is a variegated form of this species, having white margined leaves, or so I’ve been told. ‘Bright One’ (Bright blue-red corolla with rose coloured corona – differs from cv. Pink Silver in colour of corona). ‘Dapple Gray’ (I place this here though I’m not certain it belongs. Ms. Andrews who distributed it, labeled a pink flowered carnosa with this name in the picture book she rented me but all the flowers I’ve seen so labeled have been purple. ‘Fresno Beauty’ (Kloppenburg named this for his home town). ‘Grey Lady’ (I’m unfamiliar with this cultivar – I suspect it’s from England – the way gray is spelled is what gave me that notion). ‘Jungle Garden’ (From a California grower. Little different from cv. Pink Silver). ‘Jungle Green’ (No such as far as I know– I suspect that someone just couldn’t think of Jungle Garden and started calling it Jungle Green – lot of that going around)! ‘Leenie’ (named by Dr. James Broton for his wife, Eileen). ‘Pink Silver’ (the best of the best – a Hummel creation). ‘Pretty One’ (????. I question this because I once rented Ms. Loyce Andrews Hoya Photo Album. 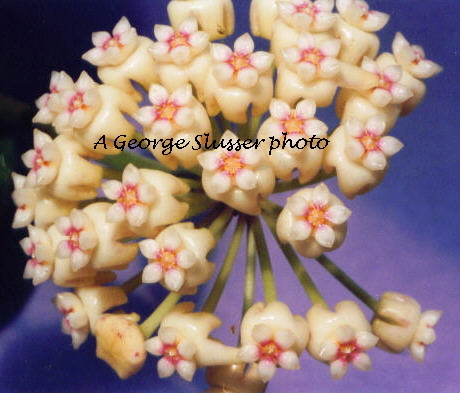 She showed this as a pink flowered Hoya carnosa look alike. The one she sold me had pink flowers too, however, everyone else I ever heard of who got a ‘Pretty One’ from her got a plant with ‘Pink Silver’ look-alike flowers with broadly ovate leaves. ‘Red Buttons Seedling’ (unnamed Miyashiro seedling). ‘Reva’ (Kloppenburg named this for his mother). ‘Royal Hawaiian Purple’ (often sold mislabeled as Hoya pubicalyx var. chimera and as cv. Chimera). ‘Silver Leaf’ (similar to ‘Pink Silver’ but with rounded leaf bases and not as much silver speckling). ‘Silver Knight’ ( Seen by me only on a wholesaler’s price list – turned out to be cv. Pink Silver). to be the same plant--holesaler even admitted to the truth). ‘Red Masterpiece’ (Another from Miyashiro). ‘Chouke’ (Reputed to be Hoya carnosa X Hoya serpens, bred by Emilio Begine in Belgium. ‘Golden Eye’ (Miyashiro cross of Hoya vitellinoides X Hoya incrassata). ‘Kaimuki’ (Miyashiro cross of Hoya archboldiana X Hoya macgillivrayi). ‘Mathilde’ (Another Emilio Begine creation, a sister seedling of cv. Chouke. ‘Minibelle’ (Named for Minibelle Hummel, hybridizer’s wife; Hoya shepherdii X Hoya carnosa). ‘Napali’ (Another Miyashiro cross of Hoya archboldiana X Hoya macgillivrayi). ‘Shepherdell’ (Sister seedling of ‘Minibelle’). are quite different. See below. Hoya subquintuplinervis X Bangkok-4 -- close up view of flowers. Insect Pollinated Cultivars with unknown pollen donors. ‘Gold Star’ (Most people think this is a species because it is sold as “sp. Gold Star” by Mr. Green and others. Per correspondence from the late Genevieve McDonald, she noted that ‘Gold Star’ was one of her seedlings. She said it came from a pod pollinated by insects where the “mother” plant was growing in a tree in her yard at Merritt Island, Florida. She did not know the name of the “mother” plant, only that it was an Eriostemma). End of list of cultivar insertion. Dr. Quack, aka Carol Noel, said, “If you grow them (hoyas) as an indoor plant with a dormant season and a growing season, you need a different regimen than a hoya that grows and blooms all year long.” I see a lot wrong there besides the grammar. My observation is that plants that I grow indoors do NOT have a dormant season. There are two reasons for this. 1). I have central heat in my home so it doesn’t get cold enough for growth to stop. I think that all who grow hoyas either live where it is constantly warm or else they have heated houses, as I do. 2). My windows are shaded from sun in summer but in winter, when the leaves are off the trees, my windows let in a lot of sun. This high light level, combined with heated rooms, keeps my hoyas growing in winter. I move them out to the deck or greenhouse in summer, where they continue to grow and bloom. Dr. Quack says, “A good rule of thumb is a complete fertilizer at ½ strength (that is a fertilizer with a balanced NPK, and major and minor nutrients) all year …. Then one with a higher middle number (say 10-60-10) from early spring to late fall. First off, you don’t combine N,P& K with major nutrients. They are the major nutrients. As for using one with a higher middle number from spring until fall, it seems to me that Dr. Quack’s advise is what we call around here “bass-ackwards.” --- and then some! Hoyas, for the most part, grow like weeds, rampantly. A balanced fertilizer is great when your plants are small and you want them to quickly grow into specimen sized baskets but when they start eating up space, it is a good idea to start using a fertilizer that is low in nitrogen. It is NEVER a good idea to fertilize with anything containing nitrogen during autumn and winter months, unless you live in the tropics. This is because in the semi-tropics and temperate zones, there is always a chance of power outages in winter. Many tropical plants can survive an hour or two of freezing temperatures, giving one time to light auxiliary heaters, if they have been “hardened off” before the freeze. Plants fed a balanced fertilizer, such as 10-10-10 or 14-14-14 (two popular formulas available here) will have a lot of tender new growth which will turn to mush in a very short time. If you are going to use a balanced fertilizer use it from March through September (in most US zones). Withhold fertilizer from October until the end of February unless you can find a formula such as 0-10-10 or 0-30-30. Such a formula will promote root growth and flower formation, but will not encourage new, tender foliage growth. Dr. Quack also says that watering with rain water is better than with city water, which is pure bull. That was probably true once upon a time but isn’t necessarily true now. I’m sure all of you have heard of “acid rain.” With the “moron-in-chief” sitting in the oval office, we are liable to see more and more “acid rain” as he keeps lifting restrictions formerly imposed on industry by the EPA. He has tied the hands of EPA employees to the point where it is an almost completely useless government agency. True, city water is filled with chemicals but all the good greenhouse growers I know have learned how to use it without damage to plants. Those with only a few plants draw their water early and let it sit all day or overnight, allowing. those chemicals settle or dissipate. Also, we’ve learned that those chemicals are strongest in the early morning so, if we wait to water until later in the day, they will not be a problem. Maybe hoyas grown in houses in Hawaii have dormant periods but houses in none of the places I’ve lived have been cold enough or shady enough to make indoor plants go dormant. I’ve lived in both eastern and western Massachusetts; Erie, PA, Glen Ellyn, IL, Milwaukee, WI, Walterboro and Hampton, SC, Thomasville, GA, Lakeland, FL and Atlanta, GA. I went to school in Princeton, NJ. I grew houseplants indoors, in all those places and never had a plant go dormant in winter. I had to protect my houseplants from the sun in SC, GA and FL and to some extent in NJ but never in any of the other places. Once in Western, MA, when it rained on St. Swithin’s day (July 15) and for 50 (not 40) days thereafter I gave them as much light as I could, only gradually acclimating them to light when the sun came back out. Ms. Wayman’s descriptions don’t match my observations. For instance, she described the flowers of the one she calls Hoya plicata as having “olive green petals,” and says that “it will always remain a favorite of ALL who grow it.” I really get ticked off when someone else speaks for me. I am part of that all. I’ve grown it for many years(including before she ever heard of it) and I can honestly say that I never saw a flower on it with “olive green petals.” All I ever saw were muddy gray flowers, tinted pink. As for it always remaining a favorite of mine, NO WAY, JOSE. It isn’t my least favorite hoya but it comes very near being that. Wayman says of the picture she has mislabeled as Hoya bordenii that, “The name bordenii has been attached to at least a half dozen different hoya species.” Not true as far as I know. I can think of only 1 besides this one. She added, “The determination of this particular plant as this species, appears to be correct.” She is dead wrong about the hoya pictured here being Hoya bordenii. It doesn’t in the least bit fit either Schlechter’s description nor his type specimen, which I have seen up close and examined under the lens of my microscope. I presented what I believe any rational person would take as proof that the hoya pictured here is NOT Hoya bordenii in vol. 2, #1 of PS-TheHoyan. Take a good look at it and, please suggest to Ms. Wayman that she do the same! If I had to pay for this, I’d resent paying for such an ugly picture (looks like someone on Chemo, which I hope it’s not). If it were a picture of me, I’d be very upset, just as I was when Carol Noel plastered a very unflattering picture of me all over the Internet WITHOUT asking my permission! I was wearing one of those ugly dresses that she made and brought to my house and insisted that all the females present wear. I was cutting up, by deliberately standing with my upper body leaning back and my stomach poked out trying to look like I was ready to deliver (an impossible feat for someone my age) because the dumb dresses made all of look pregnant. I didn’t expect to have my picture in anyone’s scrapbook, much less on the Internet. My only consolation is that she looked just as bad (or worse) than I did. Nor do I want to see pictures of pretty people unless there is some special occasion that warrants it. I think a plant society publication should spend its money on pictures of the plants of its specialty. On this page DK made two statements that I find hard to believe. He said that he believes that there are over 2000 species of Hoya. I think he believes that any herbarium specimen that hasn’t been identified is an unpublished species. When he visited me (in order to see the Schlechter type specimens and other specimens sent to me from Berlin) he stated quite frankly that he wasn’t interested in any identified specimens. He said he was only interested in those without identities as he wanted to publish them. After just barely seeing those specimens for a few seconds, he went home and published a slew of them. Schlechter had the reputation of publishing everything twice so one would think that if he didn’t publish a name on one of his specimens that even he must have suspected it had been previously published. We know that there have been over 500 species NAMES published (including the 48 species names published by Kloppenburg, many of which had already been published with other names). None of out collections contain even a third of those 500 species (assuming most are different species, which they probably aren’t). It stands to reason that some of those unidentified things could be and probably are some of those previously named species. When he has found and identified all of those previously named species and finds that he has about 1500 more hoya species that don’t fit in anywhere, I’ll believe him but I am quite confident that will never happen. I do not believe that Mr. Kloppenburg has the largest collection of hoya literature anywhere. I know for a fact that he got most of what he has from me and I didn’t give him copies of nearly all I have. My collection completely fills two 6 ft. long shelves, plus 2 file cabinet drawers, each 31 inches deep, plus 2 file cabinet drawers 19 inches deep, plus 2 file cabinet drawers 14 inches deep, plus half dozen boxes the size that holds ten reams of printer paper Also 4 shelves 26 inches long – and that doesn’t even count all the copies of Fraterna and the hoya fiction written by Kloppenburg. In addition to that, almost every flat surface in my house holds several folders with Hoya descriptions in them waiting to be filed away in their proper slots. Do I think I have the largest collection of Hoya literature in existence? Hell if I know! All I have are Xerox copies (which is all he has too). I’m pretty sure that the largest collection of originals can be found in the library of the New York Botanical Garden. I have read that it has the largest collection of botanical literature in the entire world. It doesn’t have all. I found more things there than any other place. I found a hand written copy of the Backer and Bakhuizen van den Brink, Jr. Flora of Java manuscript at Smithsonian, along with a suitcase full of stuff not found at New York. I searched diligently for copies of several Dutch publications, including one in which Bakhuizen van den Brink wrote about Hoya puber. I even wrote to Leiden and no one could supply me with copies. I finally found it and three others from the same publication in the library at the University of Minnesota. There were still other things I couldn’t find in those places that I found at the University of Georgia and at Clemson University in South Carolina. I also found a lot at the USDA Library in Beltsville, MD. I also have about several dozen copies of papers sent to me by Kloppenburg. Fortunately, I already had good copies of the same pages. Everything Kloppenburg copied and sent to me had either the top, bottom or one side cropped off. This makes me wonder if he really has full copies of anything I didn’t send to him. Making partial copies seems to be a male hoya collector’s signature! Back in 1978, I visited David Silverman at his parents’ home on Long Island, NY. He had, he thought, collected all the original hoya descriptions. He’d thought that the only place they could be found was at Kew in England so he went there to collect them. I wanted to see them. I immediately recognized that Mr. Silverman did not have what he thought he had. He had, for the most part, only partial descriptions. He had, just as I had, made a copy of all issues of Index Kewensis, noting title, volume and page numbers for each hoya listed. This told him where each name was originally published. At Kew (and at NY) only library personnel is allowed in the stacks. If you want a photocopy of anything in the Kew Library, you must list the publication title, author and page number. I was told that at Kew, they will make those copies for you and only those pages you list. Mr. Silverman did not consider that a description that began on one page might carry over unto the following page. He couldn’t read Latin and did not know until I told him that most of his descriptions were not complete. . Mr. Kloppenburg’s descriptions are not complete either because when he made his copies (one for him and one for me) he was careless and cropped off parts of each page he copied. My opinion is that page 14 of this issue of Fraterna was unbearably dull and a waste of time and money. And I wonder how many lifetimes it will take Mr. Kloppenburg to learn that the singular of species is NOT specie? Two pages of very poor pictures, only two pictures recognizable as being what the labels say. Both of these are pictures of Hoya kanyakumariana. The only interesting thing in the entire issue was ---- er-uh—I couldn’t find anything interesting!!!!!!!!!!!!!!!!!!!!!!!!! !